A restoration group is appealing for volunteers to help re-chalk one of Wiltshire’s oldest hill figures. The Cherhill White horse, cut into the Marlborough Downs, is owned and maintained by the village of Cherhill. The 232-year-old hill figure underwent a major facelift in 2002 after losing both its whiteness and its horse shape. Since then the 18th Century landmark, the second oldest in the county, has required a “re-chalking” every two years. “It had been continuously scraped to reveal fresh chalk but that left a three foot cliff at the top of the horse,” said the restoration group’s chairman, Rob Pickford. The horse, one of nine such monuments in the county, requires up to 10 tonnes of chalk to restore it to its former splendour. The chalk, funded by donations from visitors to the Downs, is being “brought in” after the last chalk quarry in the county at Mere closed down. 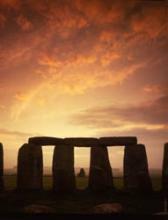 Natural erosion from the weather is normally responsible for the discolouring of the ancient monument. However, this year’s unusually dry and sunny conditions have “bleached the chalk”. “It’s looking quite white at the moment but in February it was looking particularly grey,” said Mr Pickford. The re-chalking is due to take place on Saturday 14 May and is expected to take up to six hours. Volunteers are being asked to meet at the Black Horse car park at 9:30 am “armed with spades.” I am taking the kids and a picnic – see you there ? The Wiltshire Countryside is famous for its white horse chalk hill figures. It is thought that there have been 13 white horses in existence in Wiltshire, but only 8 are still visible today. 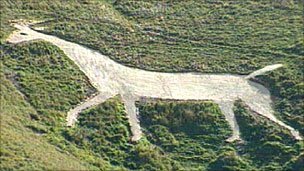 The oldest, largest and perhaps the most well known white horse is carved into the chalk hillside across the border in Oxfordshire. Little is known of the history of the Uffington White Horse, but it is believed to have influenced the cutting of the subsequent Wiltshire horses. The first of the Wiltshire white horses to appear was at Westbury in 878AD, although this figure is no longer visible as a new horse was cut on top in 1778. The most recent horse was cut on the hill above Devizes to celebrate the Millennium.